The Hail Mary as it is now recited clearly divides into two parts. 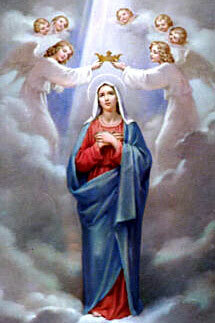 The first, “Hail Mary full of grace, the Lord is with thee, blessed are thou among women, and blessed is the fruit of thy womb, Jesus” – is constructed from the archangel Gabriel’s greeting to Mary at the Annunciation and Elizabeth’s greeting at the Visitation. There is evidence that Gabriel’s words were used in private devotions in at least the eighth century and possibly a century or so earlier in the East. In the West it appears in the Offertory of the Mass in the Fourth Sunday of Advent in a liturgy traditionally ascribed to St. Gregory the Great. As a popular prayer in its own right the Hail Mary does not seem to have come into general use until the eleventh century when the Little Office of Our Lady came into vogue. That office made considerable use of the first part of that prayer and in the course of the eleventh century it became more widely known as a hurried greeting when passing statues of Mary or before a Marian altar. As these were quick prayers it is possible that they ended with “among women”, although by the twelfth century they seem to have continued to “fruit of thy womb”. The second part of the prayer, “Holy Mary, Mother of God, pray for us sinners now, and at the hour of our death”, developed from beginning of the fourteenth century and became a fixed form by the end of the fifteenth century, in the words in which it is still recited. As a popular prayer, the complete Hail Mary was not in use before the sixteenth century.